With these 8 adjectives I have described, allow us to learn many more new perspectives of Kenya and also among each other of this 15 IBMer team. There are many occasions in these 20 days that we have to apply what we have learned and experienced in our daily lives. The following photos shares about our recent Kenya 8’s team weekend event that we scheduled almost a month ago. If this blog is going to be read by the CSC Kenya 8+ team, I would strongly recommend the entire team to schedule such an enjoyable team building event trip to Lake Naivasha. 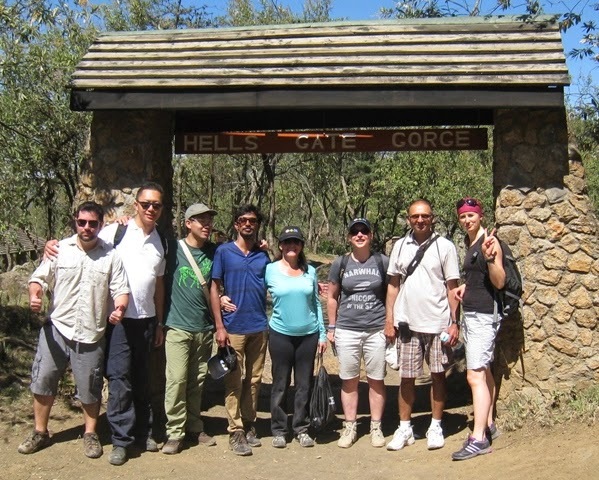 From my team from Kenya 8, there were 8 of us who chose the biking activity at hells gate national park and trekking at hells gate gorge. Biking as a team, we watch each others back, the terrain is unknown to all of us and the team moves as pack while passing vehicles kicks dust into the blue horizon of the dusty tracks at hells gate national park. Being used to cycling on paved bicycle tracks in parks with the environment of mean sea level of about 15m back in Singapore, this cycling experience of dusty and rocky path with mean sea level above 1800m was indeed challenging. It is also critical to choose the appropriate bikes with serviceable brakes, gears, tyres for this trip. Nevertheless, fresh water to keep myself hydrated. There is never a bad time to stop for photo shoots and get sips of water on the way to hells gate gorge. There is no 'I' in a TEAM, this trekking session involves much appreciated team work in guiding and holding one another through the slippery and steep terrain of the gorge. After biking for 1.5 hours at the national park before arriving at the gorge, we are almost in the state of "shack cannot think" also known as exhausted in Singapore military training context. But the team just simply enjoy the great companion of each other while watching out for one another in the entire gorge experience. After trekking the gorge, we had a recharge of sugar and a brief break before we head back with our bikes to the main gate via the dusty and rocky path.